This bride and groom wanted portraits by the ocean enough to drive all the way to Ruston Way in Tacoma during the break between their wedding ceremony at Rock Creek Gardens and reception at Mama Stortini's restaurant, both located in Puyallup. 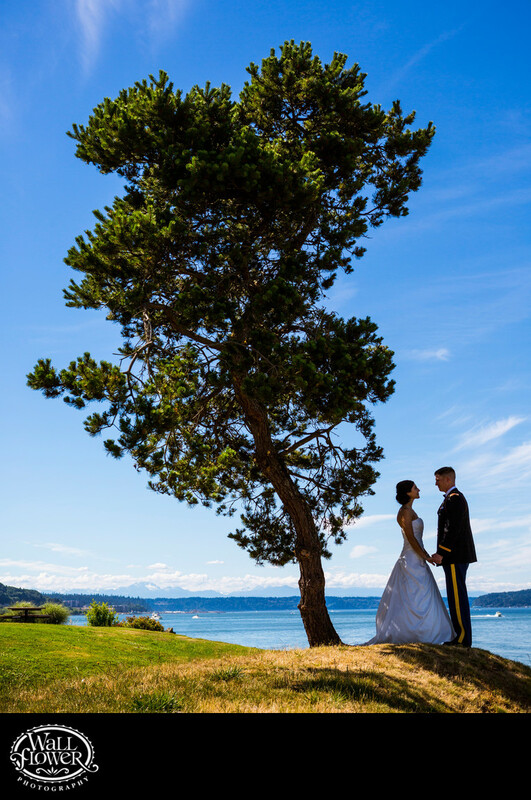 This tree caught my eye for its bonzai-like appeal, and I went with a simple, graphical pose for the bride and groom, knowing they would be somewhat silhouetted against the bright blue of the sky and water. The setting is very close to Chinese Reconciliation Park at the end of Ruston Way nearest to downtown.